Rec-league cheer with an All-star attitude! The sport of cheerleading combines athletics with performance. Sideline, All-Star Competition and Performance cheerleading include a variety of many elements. Some skills come naturally -- good hand/eye coordination, a bright smile and a bubbly personality. Many skills take time to perfect-- multiple stunt sequences, super high toe touches, and elite tumbling. One thing ALL cheerleaders have in common is that they started with the basics. Lee Franconia Cheerleading participants learn basic skills needed for sideline cheer -- cheers, chants, motions, jumps and dance. Stunts and tumbling will be conducted safely, and progress according to individual & squad ability. A 2.5 minute routine will be choreographed for Performance Day to include all of these skills. Practices will also include conditioning, needed to build stamina and improve coordination. 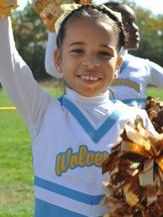 Additional requirements for successful cheerleading include a: Strong Voice, Positive Attitude, Enthusiasm, Winning Smile, & Ability to work with others. Below are some examples of what is covered in summer camp and during the season. Combined with spirited cheers and crowd-pleasing chants, LFFL cheerleaders will own the sidelines at every game. Go to "Other Fun Stuff" to see a list of local gyms that offer tumbling classes. Motions should always be sharp and tight. Keep motions in your peripheral vision, while looking straight ahead. Shoulders are relaxed, but elbows locked. Wrists are flat, not bent. Don't overextend your arms. A "T" is level. A "V" should look like a V.
Clap cleanly -- elbows in, your clasped hands right below your chin. Every movement you do is a motion including claps/clasps, bringing arms down to your side, etc. Always be quick and precise. -Start with feet together and arms by your side. -Count 5,6,7,8. On 8 clasp hands. -On 5, whip your legs back together, landing with knees bent and arms by your side. Hold for count 6. -On counts 7 & 8, stand up and clean (arms by your side).